As the Slave Dynasty commenced the Islamic rule in India around 1200 AD, under Qutbuddin Aibak, the slave general of Muhammad Ghori, and later Sultan Iltutmish, the immediate consolidation of their empire happened through wars and annexations of the different kingdoms present in Hindustan at that time. After having subdued the imperial city of Kannauj, Iltutmish’s son Nasiruddin Mahmud had turned his forces to a nearby town of Asani (also known as Asi in the earlier Sanskrit texts). The town of Asani, though not of major importance in the political scenario of Hindustan, was famous for its impregnable fortress which armies of the invaders had earlier repeatedly failed to breach. The fortress had been built by the ruling Chedi kings to protect the town from the attacks of the other warring kingdoms of north India. The location of Asani is identified to be between Allahabad and Kanpur, being about 117 kms from the former and 75 kms from the latter. The Vatsya kingdom was one of the 16 Mahajanapadas (great kingdoms) of Aryavarta in the Vedic period and from that time itself Asani was a town situated near their eastern border, which they shared with another mighty kingdom Madhyadesha. In the later Vedic periods and also during the Maurya and Gupta regimes, Asani experienced the rise of Buddhism and later Brahminical Hinduism as its religious and cultural vein. Sanskrit was the main language of the region. The later excavations in the region of Asani and Bhitaura have revealed findings and inscriptions which validate the emphatic influence of Buddhism and Hinduism in the area. The famous Chinese pilgrim and Buddhist monk, Hieuen Tsang is also said to have visited Asani in 630 AD during his travels in the region. Further, the archaeological excavations have validated the time period of the Asani fortress through the remnants of the bricks which were used in its construction. Nasiruddin Mahmud, Iltutmish’s son is credited with the conquest of Asani as he successfully broke through the once invincible fort of the town and captured the city, around 1226. Such was the euphoria of this victory and for finally breaching the un-conquerable Asani fortress, that the Delhi Sultan joyously named the city ‘Fatehpur’ (Fateh meaning victory). Thereafter the administration and governance of the region passed on to the Turkic generals and it became part of the Delhi Sultanate. 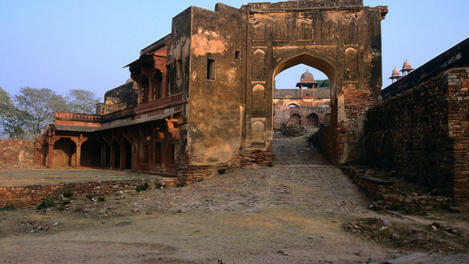 The city lost its original name of Asani and has been since referred to as Fatehpur. As centuries rolled on and with time new Sultans occupied the ‘takht-e-Dilli’ (throne of Delhi), Fatehpur remained insignificant in its place as a quiet town. In 1561, Emperor Humayun invaded the nearby Jaunpur state, the tremors of which were felt in Fatehpur. But in 1659, the city saw a bloody war on its turf when Aurangzeb fought a fierce battle with his brother prince Shah Shuja, (who was the governor of Bengal at that time) at Fatehpur. In the later Mughal period when the powers of the Mughal Emperors at Delhi started waning, Fatehpur changed hands between the rulers of Jaunpur, Kannauj and Delhi. During the British Raj, in 1801, Fatehpur and the nearby region was ceded to the East India Company and was soon made a sub-division and in 1826 the district headquarters. Fatehpur made its mark in the Indian independence movement when during the outbreak of the 1857 Mutiny, a group of English officers were allegedly attacked and hanged on trees by mutineers storming the city. Today Fatehpur stands as an upcoming city, one among the thirty-four cities benefitted by the grants from the Grants Fund Programme of the Government of India, and a notable station on the Kanpur-Allahabad rail route. I am participating in the #BlogchatterA2Z challenge and today’s letter is ‘F’. Thanks Varad.. happy that my last minute thought of including the note has helped ! Thank you so much Tina for visiting my blog and reading the post! Thank you for your kind words and I am happy that you liked reading my posts. Having read your posts too, I can say you are an accomplished writer and thus coming from you, the compliments are indeed encouraging. You have done a great job of researching so much on Fatehpur. Thanks for the line in the end. I am actually not a great fan of history yet your post enhance my little knowledge here. Keep up the good work. Thank you Sudha for your words of encouragement. I am happy that my posts are evincing interest in you towards history. Thanks for an insightful post, Sayan. Got to know about the vedic era connection and history of Fatehpur which I was not aware of. Thanks Shilpa for your comments and I am glad that you liked the post. I have read your post on F and have left my comments too. This indeed was exhaustive Sayan, I am leaving enriched. This sure shall turn out a great compilation at the end of the challenge. Thank you Roma for your encouraging comments and I am happy that you liked the post and felt enriched on reading it. Best of luck to you too for the A2Z challenge.. Very well informative. Great to know such things about this city. Thank you Sayanti for your visit to my blog and for reading the post. Thank you for your positive comments too.. I shall surely read your posts too! You take us into the roots of the history of every city you describe. Well researched and full of interesting details. I have heard of Fatehpur quiet often but I never knew its original name was Asani and it had such an interesting history. I read the whole post, thinking it was that same Fatehpur, and then wondering why when I've been to Fatehpur-Sikri did I never know all this. And then I read the note. Had to read it all over again with a fresh mind. Serves me right for not knowing our history. Thank you for that short and informative history lesson. Hi Piyusha.. thank you for visiting my blog and reading the post and also for taking time out to post your comments. I am happy that you liked and found my post informative. Do not chide yourself on the confusion as it is but natural beacuse Fatehpur-Sikri is a much more popular place, and that is why I thought of putting in that note at the end!